Dr. Amanda Golchin was born and raised in Stockholm, Sweden, and moved to Albany in upstate New York prior to high school. She attended the University of Albany where she earned a Bachelor of Science degree in Biology in 2012. Dr. Golchin then attended the Pennsylvania College of Optometry in Philadelphia, Pennsylvania, where she earned her Doctor of Optometry (O.D.) degree. This rigorous 4-year program included clinical training in contact lenses (traditional and custom fit lenses), pediatrics, emergency care, low vision, and ocular disease (including Diabetic Retinopathy, Glaucoma, Macular degeneration and Cataracts). Dr. Amanda Golchin’s primary focus is on specialty contacts lenses for corneal diseases such as keratoconus and post-surgical complications. She gained extensive experience in this subspecialty by completing externships in ocular disease and specialty contact lenses at the Albany, NY Veterans Administration outpatient clinic and at a specialty contact lens practice in Miami, Florida. She is a recipient of Blanchard’s “Excellence in Specialty Contact Lens Award”, Scleral Lens Education Society’s “Scleral Lens Basic Skills Certification”, as well as “Paragon CRT Contact Lens Certification” for fitting ortho-K lenses. Recognizing the importance of giving back to communities, Dr. Amanda Golchin served on numerous volunteer missions including trips to Cap-Haïtien, Haiti, and Quito, Ecuador. 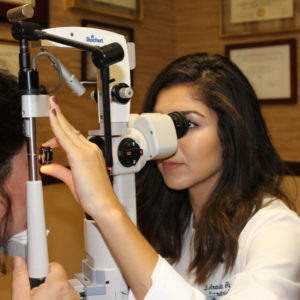 Dr. Golchin is Board Certified to practice in Florida and she is a member of American Optometric Association (AOA), the Florida Optometric Association (FOA), the Palm Beach Optometric Association (PBOA), the National Keratoconus Foundation (NKCF) as well as the International Keratoconus Academy (IKA). In her spare time, she enjoys painting, traveling, hiking with her dog, and playing basketball. Dr. Golchin is proficient in Swedish, and Farsi.